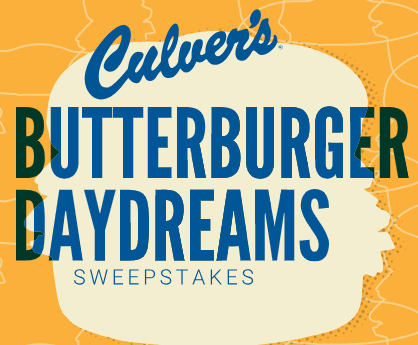 You can enter daily for your chance to win the Culvers Butterburger Daydreams Sweepstakes and Instant Win Game! Ends January 28, 2019. Good Luck! SWEEPSTAKES ONLY OPEN TO LEGAL U.S. RESIDENTS RESIDING IN AL, AZ, CO, FL, GA, ID, IA, IL, IN, KS, KY, MI, MN, MO, NC, ND, NE, OH, SC, SD, TN, TX, UT, WI or WY (EACH AN “ELIGIBLE STATE”) THROUGHOUT THE SWEEPSTAKES PERIOD AND WHO ARE 18 YEARS OF AGE (19 YEARS OF AGE FOR NE AND AL) OR OLDER AT THE TIME OF PARTICIPATING. (100) First Prizes available (awarded via the Instant-Win Game), each consisting of a Free Value Basket Coupon redeemable at Culver’s. ARV: Up to $7.50 each. Limit one (1) per person/email address. (1,400) BOGO Deluxe Coupon Rewards available (awarded at a rate of up to one hundred  for each Day of the Sweepstakes Period via the Instant-Win Game), each consisting of a Buy One Get One Deluxe Coupon redeemable at Culver’s. Limit one (1) per person/email address. (1,400) $1.00 Off Value Basket Coupon Rewards available (awarded at a rate of up to one hundred  for each Day of the Sweepstakes Period via the Instant-Win Game), each consisting of a $1.00 Off a Value Basket Coupon redeemable at Culver’s. Limit one (1) per person/email address.